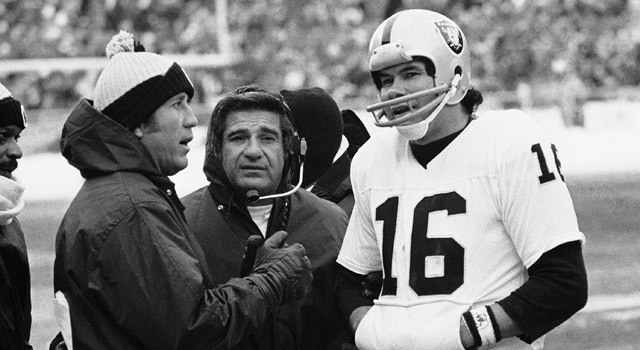 Published: May 5, 2011 at 06:04 p.m.
Coach Tom Flores (left) and QB Jim Plunkett led the Raiders to two Super Bowl titles in the '80s. Hopefully you spend this holiday the way many of us in America do, enjoying two-for-one tacos -- and other appropriate actions -- at your local cantina. In honor of the NFL's often-overlooked history of Latino players, it only seems appropriate to recognize the accomplishments of some of the most prominent Mexican-Americans in league history. A couple who just failed to make the cut are Cowboys QB Tony Romo, who is certainly climbing along with Jets QB Mark Sanchez. A couple more years of doing what they are doing, and they will certainly be mentioned in the future. Kapp once graced the cover of Sports Illustrated under the caption of "The Toughest Chicano." Kapp, who led the Minnesota Vikings to a 12-2 record and berth in Super Bowl IV, played primarily with the Vikings and the BC Lions of the Canadian Football League during the 1960s. He is a member of the Canadian Football Hall of Fame. Garcia was a four-time CFL All-Star and a four-time Pro Bowl selection as a member of the 49ers and Buccaneers. Garcia is one of only eight quarterbacks in NFL history to achieve two consecutive 30-touchdown passing seasons (2000 and 2001) at least once in their career. He also holds the Niners' single-season passing yards record (4,278). Flores, who quarterbacked the Raiders from 1960-66, later guided the Raiders to two Super Bowl titles as head coach, becoming the first minority coach to win a Super Bowl and joining Mike Ditka as the only person in NFL history to win an NFL championship as a player, assistant coach and head coach. Anybody have a logical explanation why Flores is not in the Hall of Fame? Fears, who was born in Guadalajara, Mexico, was a big-play receiver with the Los Angeles Rams from 1948 through 1956 and a member of the Rams' 1951 NFL championship team. He was the first Mexican-American selected to the Hall of Fame, when he was enshrined in 1970. Plunkett was a Heisman Trophy winner at Stanford and the No. 1 overall pick of the 1971 NFL Draft, but failed to deliver for the Patriots and 49ers before he landed in Oakland. Plunkett guided the Raiders to two Super Bowls under Flores' tutelage, including being selected as MVP of Super Bowl XV. He's the only eligible two-time Super Bowl winning quarterback not in the Hall of Fame. Muñoz was selected to the All-Pro team for 11 consecutive years and was tabbed the NFL Offensive Lineman of the Year in 1981, 1987 and 1988. He also was a member of the NFL's 75th Anniversary All-Time team in 1994 and was inducted into the Hall of Fame in 1998. "Favre's aptitude test finds the perfect job..."